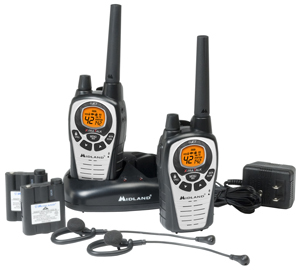 Walkie Talkies, also known as two-way radios, are a huge part of our every day life. They are used in retail stores, by security firms, event organisers, truckers, emergency services, on ships, and by many people when they are out and about in the outdoors when hiking, camping, mountain climbing, skiing, boating, kayaking etc. With so many applications, choosing the best walkie talkie for you can be very complicated. 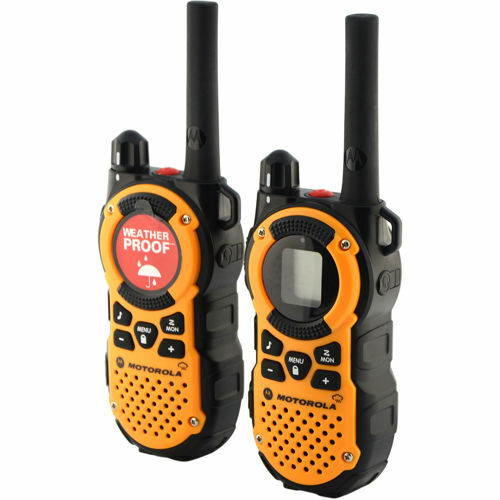 Whether you use a walkie talkie for your business, for skiing or hiking trips, or even for your kids to play with, we will help you make sense of all the walkie talkie lingo, their technical specifications and ultimately help you find out which walkie talkie to buy for your needs. Summaries of our top rated walkie talkie reviews can be found below. The Cobra MR HH500 is a top of the range walkie talkie designed specifically with rough weather conditions in mind. This handset is ideal for boating, kayaking, or in fact any other water based activity as it is completely submersible and floating, making accidents on the water less catastrophic. Additionally it can connect wirelessly with your phone, so you can store your phone in a safe place without having to worry about it getting wet. It’s sound quality is among the best we have heard, and the Cobra HH MR500 is packed with additional exclusive features like Cobra’s Rewind-Say-Again voice recorder, and a BURP feature, which literally spits the water out of the mouthpiece making it the best walkie talkie we have reviewed! The Motorola Talkabout MT350R is the second best walkie talkie we reviewed. This device is weatherproof and can take a beating in tough conditions. It is splash and dust resistant so it’s ideal to take with you on most outdoor activities like hiking, camping and indeed skiing. It has access to all features you would expect like NOAA weather warnings, dual-watch scan, hands-free transmission, noise filtering and even a bright LED flashlight. The Talkabout MT350R is rechargeable with a split power cable, with which you can charge both units at the same time. Another thing we liked so much about this model is its simplicity. The Talkabout MT350R has a clear backlit screen and relatively big buttons which makes the Motorola Talkabout MT350R extremely easy to use, even with skiing gloves on! 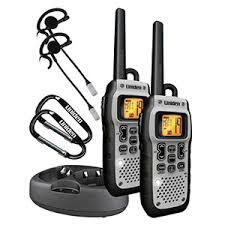 The Uniden GMR 5089 is a durable walkie talkie set that’s just made for outdoor activities. It has the longest advertised range we have seen of 50 miles under ideal conditions. The trade off is that this device is slightly heavier than the similar Cobra and Motorola models. 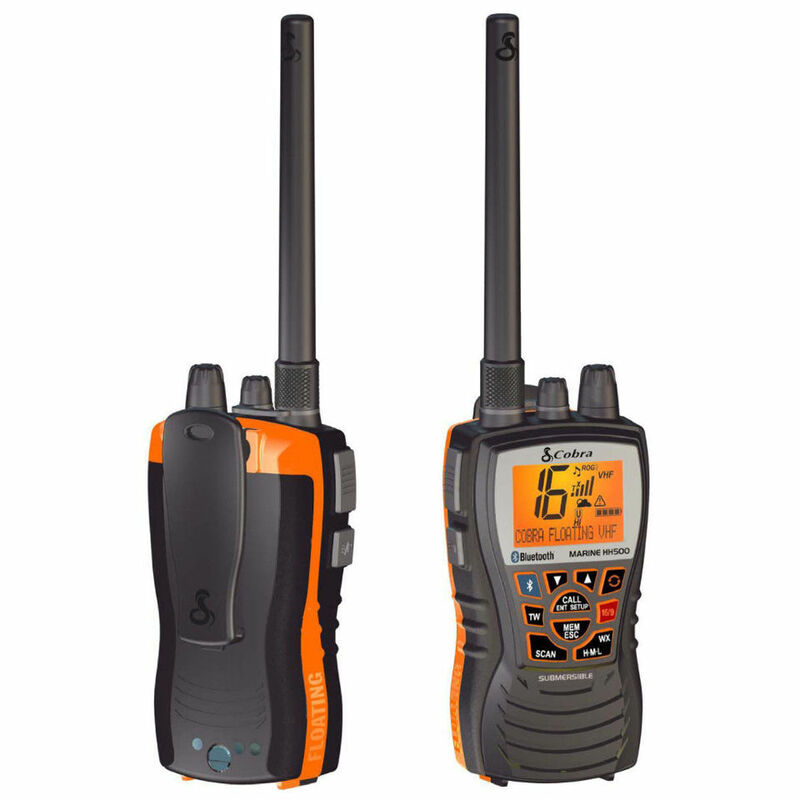 The Uniden GMR 5089 is waterproof and submersible for 30 minutes, which makes this walkie talkie great for water activities like boating, sailing and kayaking. The units come with a charging dock included, which we feel more manufacturers should do. The Uniden GMR 5089 has all the other features we would expect and more. Amongst it features are NOAA weather warnings, weather broadcasts and a huge 284 privacy settings meaning you’ll always be able to find a bandwidth for your party to use without disturbances. The Cobra CXT 1035R walkie talkies are floating and waterproof, making them perfect for your water based activities. They have a long distance range and from the moment we used them out in the woods, we knew we had to feature them in our top 5. The walkie talkies are amongst the most robust models we have seen and we feel like we could easily drop them from a great height and see them survive. This will make them extremely valuable on extreme outdoor activities like mountain climbing, long hikes and even extreme sports. The Cobra CXT 1035R walkie talkies come with all safety and alert features a man or woman could wish for with NOAA location based weather warnings, and emergency broadcasts. 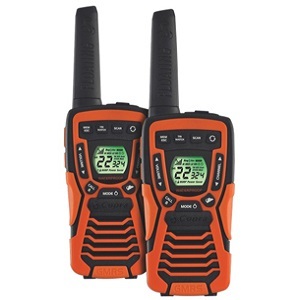 The Midland GXT760VP4 is the oldest walkie talkie of our top 5. The model has been around for years and still gets used as much today as it did in it’s first year, and there are some good reasons for that. Although slightly bigger than most models the GXT series, and the 760VP4 in particular, is known to be extremely reliable and robust. The device seemingly only has five buttons on the front, which is not a lot, but all buttons have a double function when you hold them for over 3 seconds, giving access to a wide range of features. The Midland GXT760VP4 comes with adjustable power settings, weather alerts and call alerts including a roger beep. Additionally, you are able to replace the battery pack with regular alkaline batteries, making sure your walkie talkie is never out of juice. Do I want to communicate through VHF or UHF? 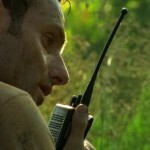 The first thing to do when you want to buy a walkie talkie is think about what you need it for. In what situations are you going to be using it. Are you using it for long mountain hikes, are you using it to communicate on boats over water, are you using it in a vehicle or in a building? 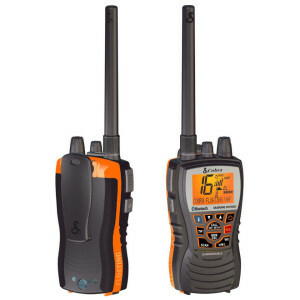 Theses factors are generally where your choice for VHF or UHF comes from when deciding which walkie talkie is best for you. Generally VHF (Very High Frequency) travels further outdoors and UHF(Ultra high Frequency) is better suited for inside use or close to buildings. It is important to note that walkie talkies using VHF cannot communicate with those using UHF. Almost all walkie talkie reviews featured on this site will be for VHF, unless we specifically specified otherwise. What are the differences between FRS or GMRS channels? Another thing to consider is whether to use FRS (Family Radio Service) or GMRS (General Mobile Radio Service). FRS is used on a lower Wattage and has a shorter range. For this reason UHF walkie talkies almost always operate on FRS channels. GMRS has a longer range due to a higher Wattage use. 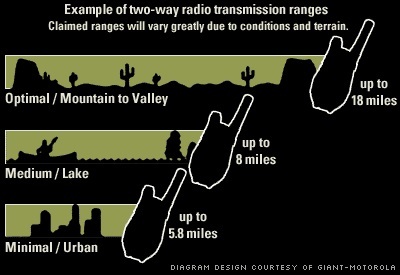 When we talk about a long range walkie talkie, we always refer to GMRS. GMRS, due to it’s longer range, has a guideline of not transmitting for more than 50% of the time because you could hog up the whole channel, so don’t use GMRS as a baby monitor. Almost all walkie talkie reviews featured on this site will have access to 22 or 30 FRS and GMRS channels unless otherwise specified. And if your walkie talkie can use them: Channels 15R-22R are repeater channels. Selecting the right channel for you is not very difficult. Taking the above information into account, you know in what channel region you should be. From here listen in on the channels to hear if anyone is using them currently. We find that many people leave their channels on the default setting (Channel 1) so this is often the busiest. From there, move one channel up until you find one that isn’t in use in your area. Many walkie talkies come with a scan feature to do this quickly for you. The next thing we featured on most walkie talkie series is the offer of privacy codes. Privacy codes are a way of encoding your channel for your specific use. Encoding is not the same as encrypting. Your messages will not take an enigma machine to decipher, but the desired result will still be met. When you and your group select a channel that seems empty, you can all select the same privacy codes. What this means is that your handset will try to filter out all the noise coming from devices on the same channel, not using your specific privacy code. Privacy codes are basically a way to personalise your channel a bit so you have less chance a stranger joins you in the middle of operation. We always recommend choosing a handset with privacy codes as a functionality. From here on out things get a little more straight forward. The range is an indicator of how far your reach will be. A lot of manufacturers give 3 ranges. The longest one is the range the device can reach under optimal circumstances. Because buildings or trees can significantly diminish the range of the product many users find that they almost never get the full range that they feel is promised to them. Below is an example image of the range a Motorola has. To find the best walkie talkie, one very important thing, not to be overlooked, is battery life. Obviously the battery life depends a lot on how often, and how long you use the walkie talkie. Generally manufacturers will either give a battery time expectancy based on the device being in standby mode. As an example, the Motorola MS350R advertises a 27 hour battery time average, but if the unit is used constantly, users have reported the battery time to be closer to 5 hours. Some walkie talkies have power saving options. By lowering the wattage used, you will decrease the range of the walkie talkie, but your battery life will go up considerably. Some devices also have automatic scans to put the walkie talkies in stand by modes when the monitored channel is quiet. Some walkie talkie models also come with the option to replace the provided battery pack with alkaline batteries. This would be ideal in situations where you might not be able to charge the battery pack for a longer period of time. Many modern walkie talkies are much more than just a way to keep in touch with your friends on a hike. 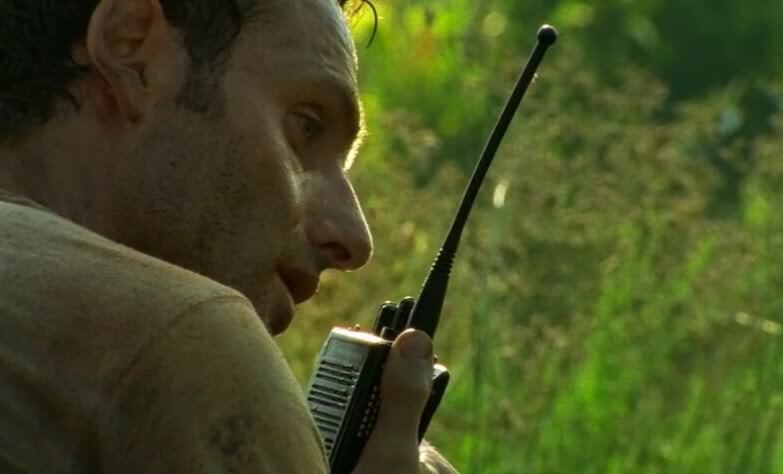 Walkie Talkies are almost an entire survival kit on their own. Most modern walkie talkies come with a variety of weather channels, and weather alerts. Personally, we wouldn’t go on long treks, off-piste skiing trips or on offshore boating trips without a walkie talkie that features NOAA location based weather alerts. When you’re on a mountain side, or out on the open water, the weather can turn on you in minutes. What may look like a nice and calm day can turn into a storm, and a potentially dangerous situation before you realise. It’s important to always be one step ahead of the game. I have a inquiry about the article, where can i speak to the creator? hi There what is the difference between a digital and a uhf walkie talkies? I’m a flagger on street construction sites. I need loud and clear I bought the motorola mu350r it has class d amp and DSP but mic is at bottom and I like it closer to top better I don’t really care about bluetooth. MT352 is same but bigger battery. What is your best recommendation between these?